Wuala has announced they are shutting down their servers and closing their doors. The real question here is, why? Wuala emerged as one of the pioneer sync and share companies to provide secure cloud storage services. Some time ago they discontinued providing free clients and since then there have been many unanswered questions. Were they hacked? Was their owner, Seagate, forced by U.S. authorities to stay away from zero-knowledge services? The demand for zero-knowledge cloud services is growing at an exponential rate and there are really only a few alternatives for business users to choose from. Many products promise security. Most lack full end-to-end encryption while others are simply too complicated to use in a team. TeamDrive is well positioned as a new home for Wuala users. Albeit it is a zero-knowledge cloud service and provides complete end-to-end encryption, TeamDrive is the only supplier who delivers a free choice of servers. Customers have the flexibility to combine multiple servers at will. Private use of TeamDrive Professional clients is free for anyone. The clients themselves have zero restrictions, however, a fee is charged for cloud storage beyond 2 GB and support. In addition these clients support plain, vanilla WebDAV servers as an alternative storage provider to the TeamDrive cloud or other TeamDrive hosting servers. As a European service provider all encrypted data are, per default, stored in the EU. TeamDrive has been around since 2009 and all of its provided services have been audited and are recommended by the Independent Regional Centre for Data Protection of Schleswig-Holstein, Germany, (a German governmental agency, which focuses on privacy protection). Moving Data from Wuala to TeamDrive is a simple process. 1.) Please download the content in your Wuala account and safely back it up to your device, as instructed on the Wuala website. The content will be stored in a folder structure on your hard drive. 2.) Download and install the TeamDrive client and register a new account. 3.) Right-click on one the Wuala folders in your file system and use the context menu "Convert to Space" to convert the Wuala folder into a TeamDrive Space. That’s it! Now you are all set. TeamDrive will now begin encrypting and uploading your data. You can now, also invite others to your new TeamDrive Space and share your data. You can also install a TeamDrive mobile client and access your files on the go. Accessing your data using your mobile device is also fully end-to-end encrypted, which is not the case with SpiderOak. The German Lawyers Association (Deutscher Anwaltverein e.V. or DAV) represents roughly 68,000 lawyers and recommends the TeamDrive DAV solution to all of its members. The service is hosted in Germany and follows Germany's strict privacy protection regulations and laws. The framework agreement between DAV, TeamDrive and Noris Network, as the technical partner, is intended to guarantee a consistent, efficient and legal solution. “Law firms and lawyers will have the certainty and comfort of not violating the interests of their clients when storing, synchronizing and sharing data and documents,” pledges TeamDrive CEO Volker Oboda. It is at all times ensured that confidential data are transmitted in encrypted form only and stored under specified conditions in a dedicated, high-security data center located in Germany. The TeamDrive DAV solution is based on TeamDrive 4 technology; the data center operator, Noris Network, hosts an extremely flexible, robust and scalable server farm based on Ceph Object Store and includes load balancing and backup. 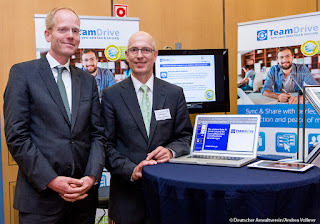 The TeamDrive DAV solution was revealed at the 66th German Lawyer’s Day on June 11, 2015 and is now available for download from the DAV website. In preparation of our TeamDrive 4 Launch in March we do a Database Maintenance today Wednesday, 2015-02-25, 6:30-8:00am CET. Sync of existing Spaces will continue to work. During this time, the TeamDrive Registration Server won't be available for TeamDrive Clients or via the Administration Console. Running Clients will indicate that the Registration Server can not be reached (for example, the TeamDrive 3 Desktop Client has an LED-like indicator icon in the bottom right corner, which will turn from green to red in case the Registration Server cannot be reached). Once the maintenance work has been concluded and the Registration Server is reachable again, the Clients will proceed as normal and the notification icon will change from red to green again.